How do I resolve this error when trying to connect to a server? It does not happen with the local machine, just remote servers on the network. I can connect to this database fine using SQL Compare. I can also connect SQL Doc to another remote database ok. I am running the most recent version of the program. What do I do to debug this issue? 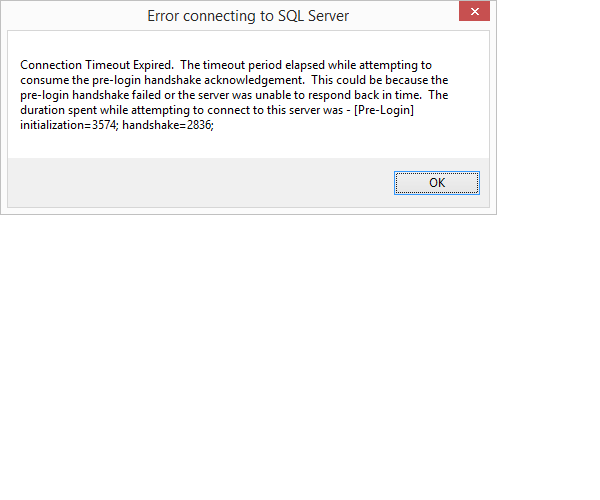 Are there connection setting somewhere in SQL Doc that I can change the timeout? SQL Doc was "remembering" the hostname of the database ( ie: "mydatabase"). Since I last used the program ( and it worked), the dynamic IP address had changed. When I used the IP address instead of hostname, then the connection worked (ie: "192.168.1.12"). (FWIW, the 'refresh' button on the connection dialog was NO help).